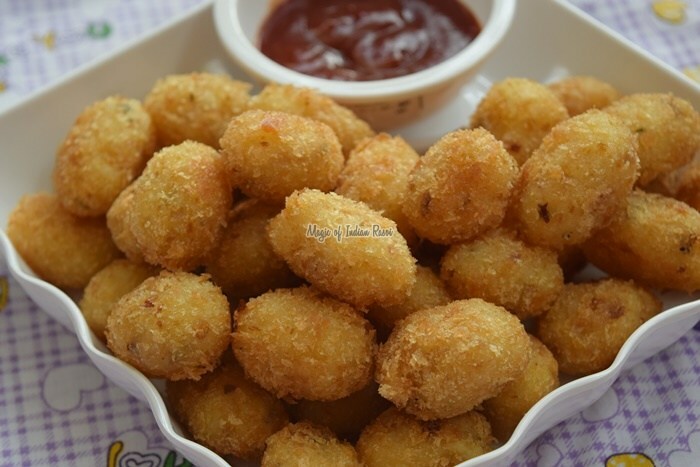 Spicy Potato Nuggets are a great party starter and can be eaten as snack at any time of the day along with your favourite Italian dish. Filled with cheese, herbs and spices it will just melt in the mouth. They can be prepared in advance and refrigerated to use it when required. You can store it easily store for a day or two. 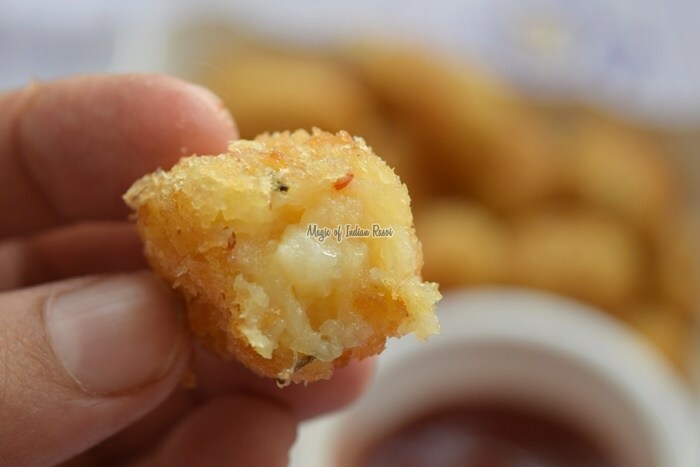 Serve these lovely nuggets with ketchup or cheese dip. 1. In a bowl take Boiled and Mashed Potatoes, 1/4 Cup Bread Crumbs, Corn Flour, Processed or Parmesan Cheese, Chilli Flakes, Mixed Herbs, Shredded Garlic Cloves and Salt to taste and mix well. Cover the bowl and put it in refrigerator for at least 1 hour. This helps in setting the mixture which will help in rolling it in to nuggets easily. 2. After 30 min take out the mixture. Take about a palm size ball on greased palm. Then roll the same in long thin pipe shape (about 1/4" in diameter). Then cut in to about 1/2" long and using fingers lightly press edges to give it a shape of nuggets. 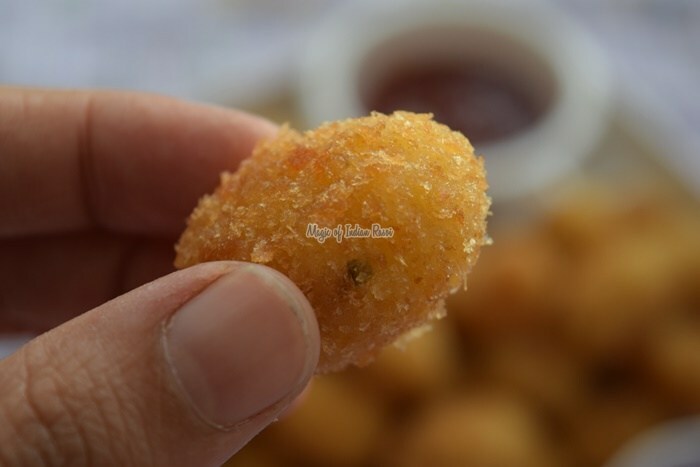 Prepare the rest of the nuggets in same way. 3. 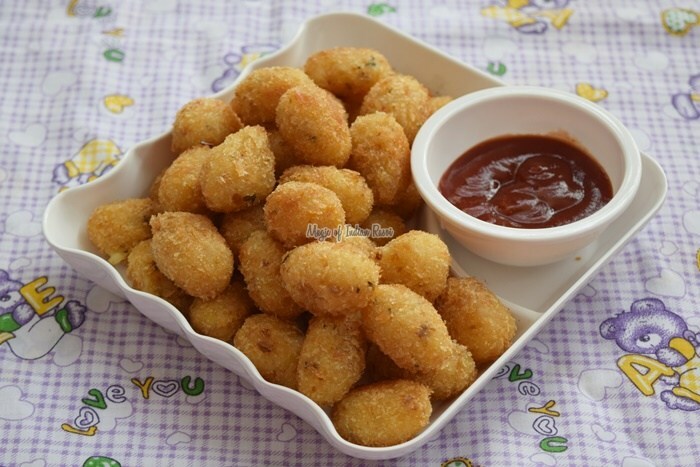 Now take the Nuggets and dip it in Corn Flour Paste and then roll it in Bread Crumbs and press lightly with hands and keep aside. Prepare rest of the nuggets in same way. Put the prepared nuggets in refrigerator for 30 min to set. 4. Now heat oil in a deep pan on medium and fry Spicy Potato Nuggets till golden brown stirring in between. It will take about 2-3 min on medium to high heat. Remove the fried Nuggets on paper napkin and serve hot with Sauce.